Coming from France, I was probably born with cheese in my hand; my first word was probably "fromage" and my first walk motivated by the Camembert in the fridge. Yes, being French, I was raised eating cheese. Imagine: there are between 350 and 400 different cheeses there, with different characteristics: soft, hard, smelly, very smelly, etc... This is one thing that I really miss in the US. Not that you cannot find cheeses there, but first, raw milk cheese cannot be imported (hello, pasteurized cheese), second, it is more expensive here. So sad: there are so many delicious ways of eating cheese; with or without bread, with butter or jam to cut the strong if not pungent taste of the cheese, or in various recipes (soufflé, gratin, salades,...). 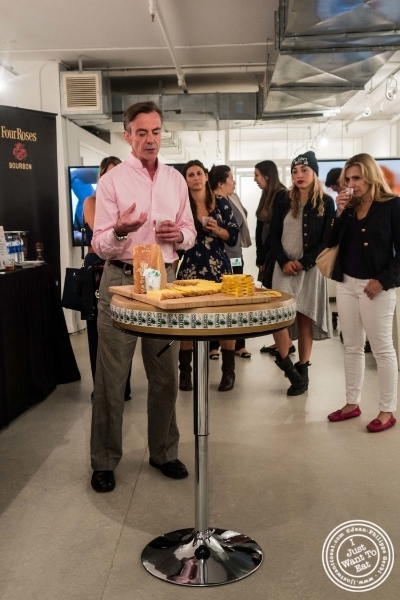 So needless to say that I was intrigued when I received an invite to attend a Bourbon and Cheese event hosted by Four Roses Bourbon and Max Mc Calman, a maître fromager, at FCB - French Cheese Board / La Maison du Fromage, a location near Bryant Park, where the photo exhibit by Thomas Laisné "Les Filles à Fromages" showcasing ladies who love cheese was on display. Bourbon and Cheese: that would make plenty of my compatriot yell sacrebleu just thinking about it! Yes, we are more accustomed to drink wine with cheese, red, although I heard few sommeliers recommend white, because red wine can be too aggressive, while white can complement. The cheeses were presented by Max McCalman, known in North America who has the precious title of Maître Fromager (Cheese Master), given by France's Guilde des Fromagers. The first cheese I tried was comté with Four Roses Small Batch Bourbon. Comté is one of my favorite cheeses. The rind is of a brown colour, and the pâte is a pale creamy yellow with a hard and flexible texture. Taste wise, it is a strong and slightly sweet cheese. It was quite interesting paired with the bourbon that had a rich, spicy and sweet flavor with a hint of caramel. The second cheese was an époisse, paired with the Four Roses Single Barrel. Epoisse is an interesting cheese: it has a very strong smell and lots of people stop there and do not even want to taste this very soft and pungent cheese. The Bourbon complemented perfectly the époisse, as it had complex, robust and fully bodied notes. The last cheese I tried was the mimolette with the Four Roses Yellow Bourbon. I admit that I am not a big fan of the mimolette, this orange cheese whose taste is close to a parmesan, similarly salty. It was another interesting pairing as the Bourbon was fruity with hints of pear and apple that counterbalances well the saltiness of the cheese. This was very interesting and after this tasting, I was thinking Bourbon et Fromage? Pourquoi pas? Merci FCB, Four Roses Bourbon and Max for this wonderful event. Please note that this tasting was complimentary, but this post reflects my opinion.